How dashboard page helps you? Total number of overdue tasks left. How task list widget works? Task tab is click-able only if it has some tasks. if Today task count > 1 then Today’s task tab will be selected by default. else if Upcoming task count >1 then Upcoming task tab will be selected by default. Able to Edit, Follow up and Delete task. Displayed View more link for each tab. Only the recent 10 activities will be displayed. 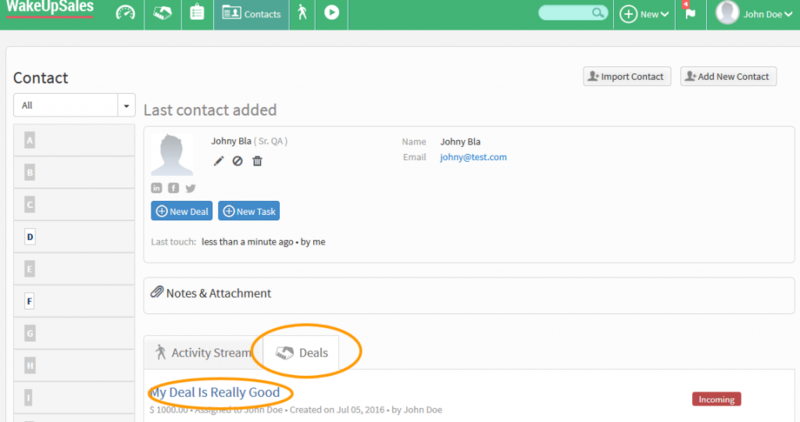 Track all the activities associated with deals, contacts and tasks. On clicking the “View more” link redirected to activity list page. Deals assigned to the current user & deal status is Won. On clicking the count redirected to won deal listing page. Deals assigned to the current user & deal status is Lost. On clicking the count redirected to lost deal listing page. Deals associated to the current user where deal status is not incoming. Note: Calculated counts for last 3 months. All task count with type Call. On clicking the count redirected to all task listing page and filter it with the task type Call. All task count with type Appointment. All active deals count with type incoming/new. 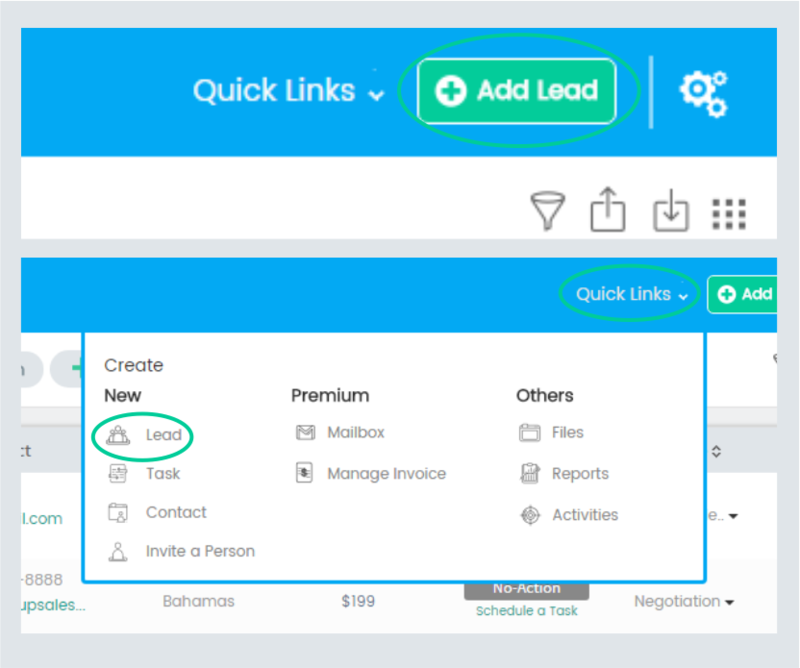 Displayed the deal close date with link to redirect the user to the deal detail page and on mouse over tooltip will be displayed with the deal name. Avg time to close a deal. Number of days spend to close a deal. Click on the Add a deal button from deals page or select from the New tab from menu section to get the deal creation pop-up. Enter deal information to create a deal. Contact name is auto suggested, and on select email, country & phone no will be pre filled. If the contact is not exist then a new individual contact will be created and associated with the deal. On creating deal, mail will be sent to the assigned user. Deal can be deleted from deal listing page or deal detail page. What you can do in deal listing page? There are few predefined deal stages are available. Click the + button to add or remove tabs to limited the tabs display. Deal listing informations are coming in JSON format for faster loading. Actions available with each deal. How to change the deal stage? Click on deal’s setting icon from deal listing page. Select Move Deal link from the drop-down menu. Popup will appear with the following field. On submit the deal status will be changed and then the deal will listed under the changed status tab. How to work with multiple deals? On selecting the deals, the drop-down present on the table header section will be activated to apply the following changes. How to add a note with a deal? In deal detail page you can add note with/without attachment, it will display under the activity stream without page refresh. How to add/edit/remove a task? Click on the Add a Task button from tasks page or select from the New tab from menu section to get the task creation pop-up. Task can be edited from task listing. On edit the task associated deal/contact field is disabled. 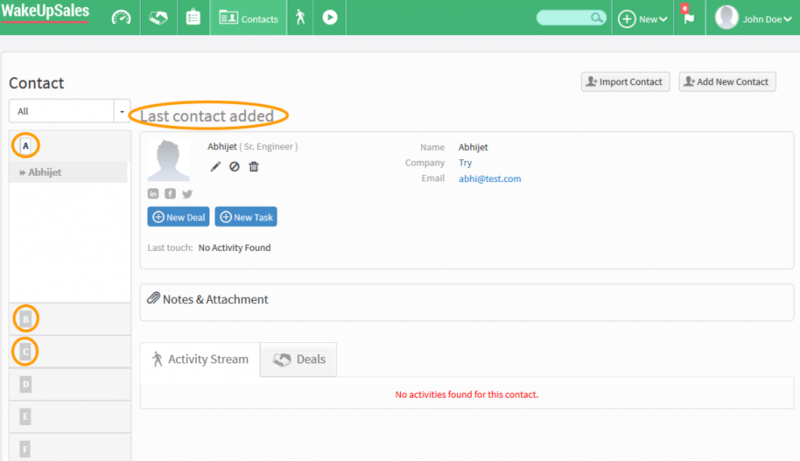 Delete the task associated with deal/contact from task listing page. How task listing page works? 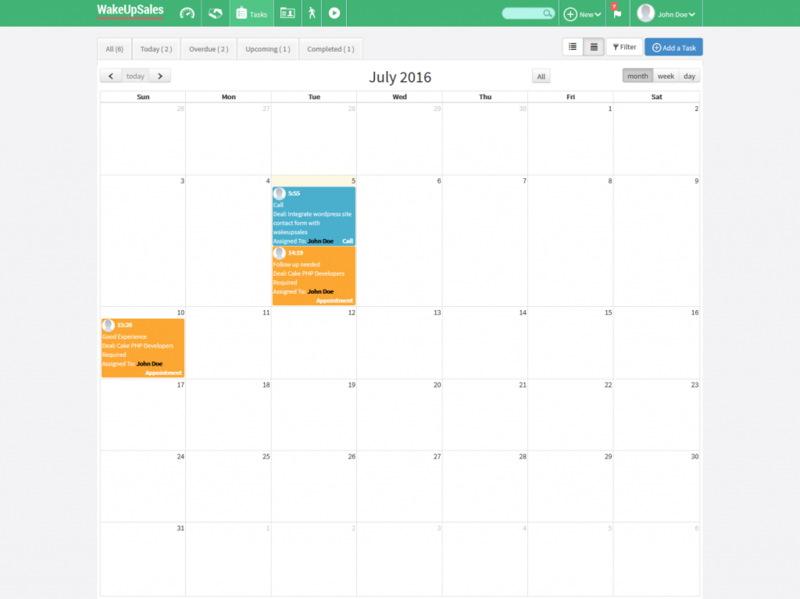 How to access calendar view in task listing page? How to access calender view in task listing page? 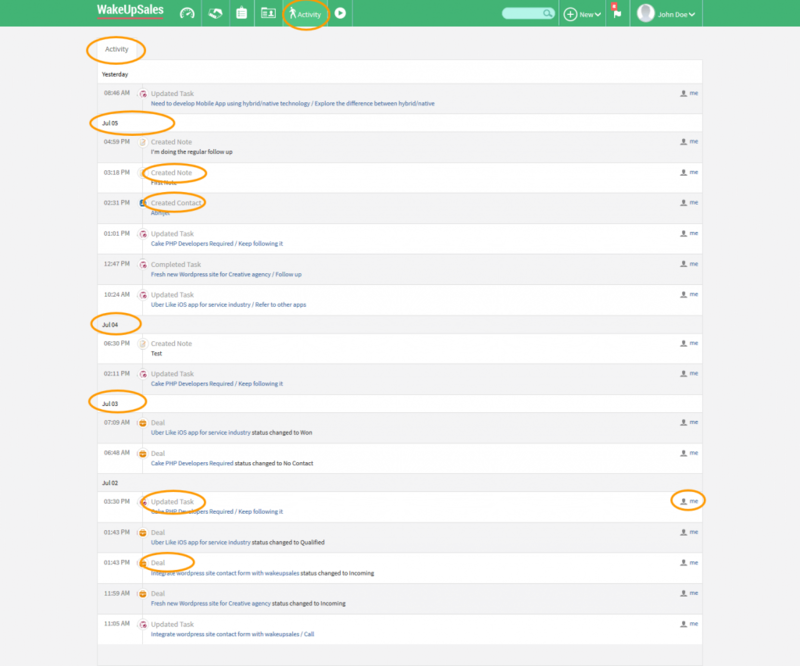 Click on the “Calender View” icon from top in task listing page. Task background color is set as per the task type. On clicking the task, it will redirected to the deal detail page. How filter works in task listing page? On clicking the reset button on the header section all the filter cookies will be cleared. On clicking the close buttons of a selected filter, the respective filter cookies will be cleared. How to follow-up a task? How to add/edit/delete a contact? Click on Add New Contact button from contacts page. Company name will be auto suggest on type. On submitting the form the individual is created and associated with the company. Click on on the pencil icon to redirect to the edit contact page. Click on the Trash icon to delete a contact..
All the contacts are listed in alphabetic order A..Z boxes. Initially it will display the last contact added detail in right section. The box will be inactive if there is no contact starting with the alphabet. On clicking the box, contacts will be listed below the box with fixed size and scroll-able. At a time only 10 contacts name will appear, on scrolling 10 more contact list will append. On clicking the contact name, detail page will appear on the right hand side without refreshing the page. How to add deal and task from contact detail? 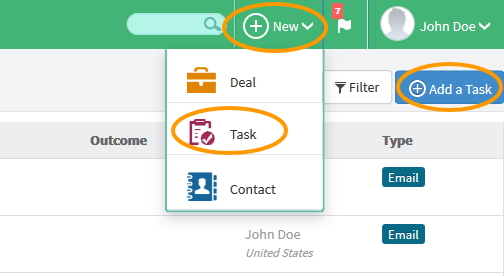 New Deal & New Task buttons to add with respect to the selected contact with prefilled contact data in the fields. How to add/update a profile picture? Click on the Pencil icon to go to the contact edit page. Click on Change Image and select the image from your local system. Click on update button to save the selected image as profile. 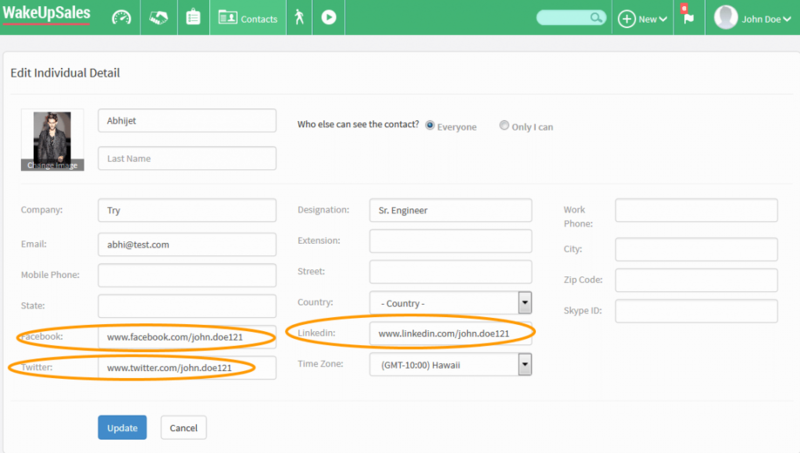 How to add URLS like Twitter, Facebook, Linkedin and others to a contact? Select the contact and get the contact view section. Click on the pencil icon to go to the edit page. Fill up the social URLs for Facebook, Twitter and Linkedin. Click Update button to save the data. 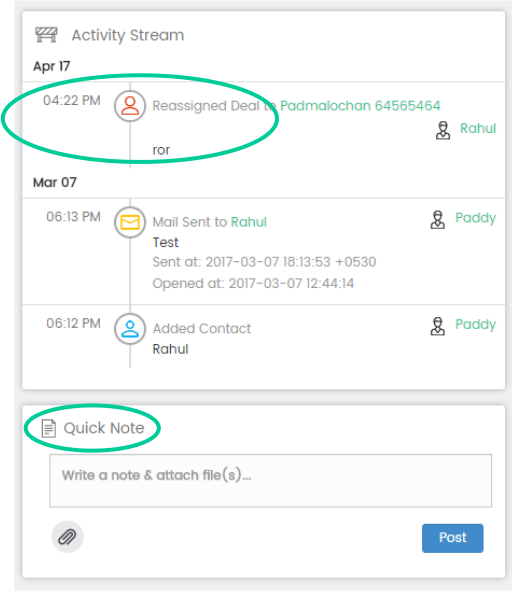 How to add note & attachment with a contact? Click on the Note & Attachment to display the next action area. Can add note with/without attachment, it will display under the activity stream without page refresh. How to track the deals created by contacts? Go to the contact listing page. Select any of the desired contact to get the contact deatils. Click on the Deals tab to get all the deals created by that contact. 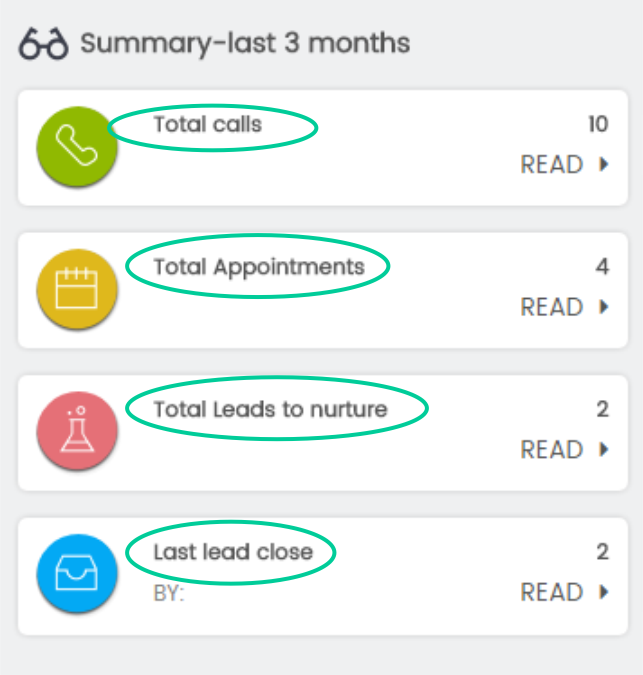 What is contact's activity stream? 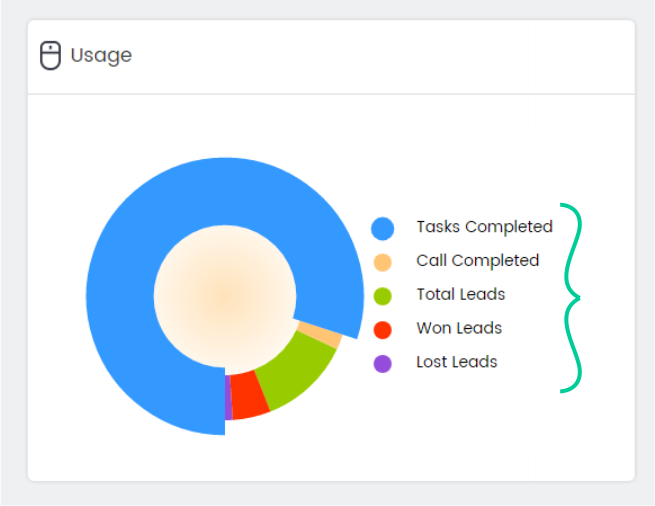 What is contact’s activity stream? It displays all the activities associated with the contact. 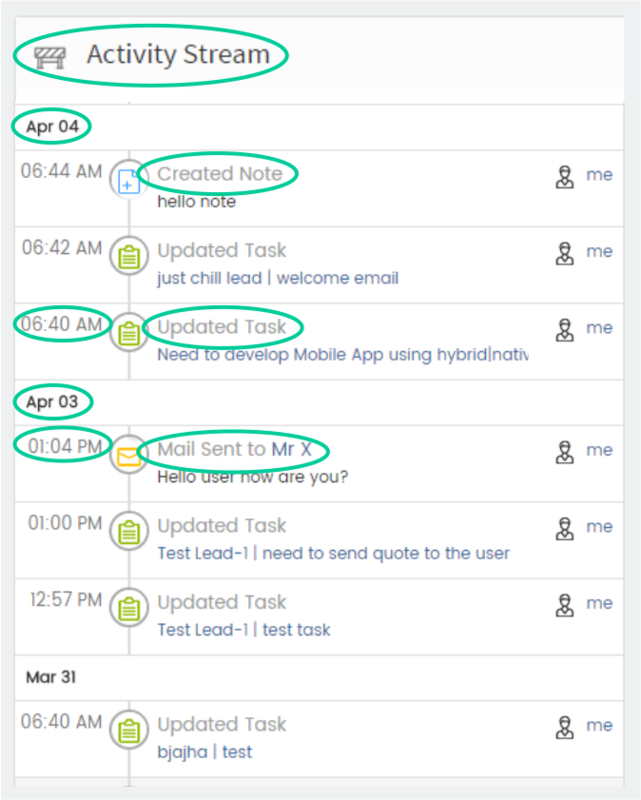 Easily track the created notes, tasks, deals associated with each contact on by created date and time. How to import contact from your gmail? Click on the “Import Contact” button. Authentiate with your valid gmail credentials. Click on your name place at top right corner of header. Drop-down will appear containing Settings, Profile, Logout. Click on the Profile link to get the profile details. Instantly edit the infos like Full Name, Password, Time Zone. Get the track of created deals by you in right side. In the tabs see the tasks assigned to you. Will track on create, on update & on delete. Contact name with link will be provided to view detail page. Created by user information with link to it’s profile page. Will track on create, assign, update, delete & contact associate. deal title with link will be provided to view detail page. Assigned to user name with link to it’s profile page only for assign deal activity. Created by user name with link to it’s profile page. Will track on note creation only. note detail with attachment and link to download the attachment if present. Will track on task create, update, assign, follow up & complete. deal title and task title. How to migrate data from other CRM ? Why we need to import data to our CRM ? 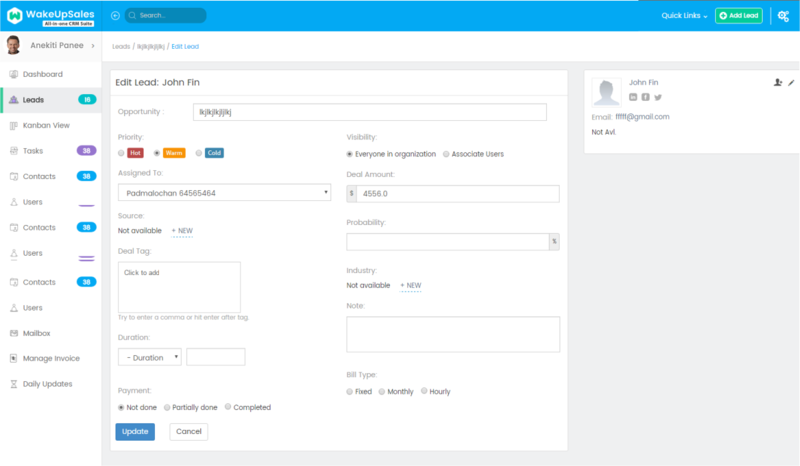 The Import functionality is the simplest way to migrate data into CRM. Data from the source needs to be put into a .csv file . It will allows the user to select the columns of the .csv file and map it to the specific entity and fields within CRM. How to import data from other CRM ? 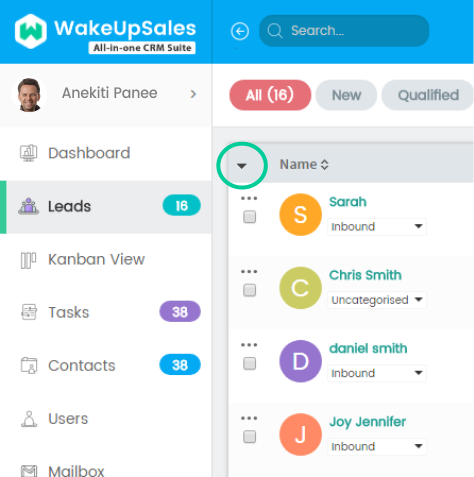 WakeUpSales allow you to import data from Zoho CRM, Sugar CRM, Fatfree CRM or any other CRM by following a sample CSV file. Click on “Contacts” tab on header. 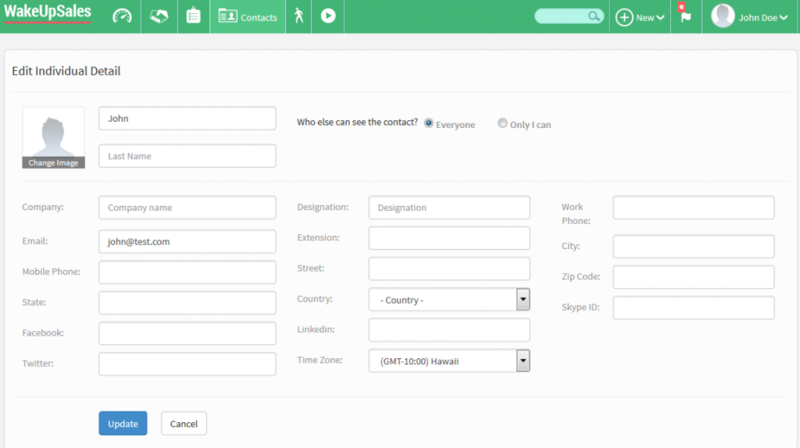 Choose Zoho CRM, Sugar CRM or Fatfree CRM from “Import Contact” dropdown list. Then, a pop-up will apper on the screen. Choose a CSV file to import. 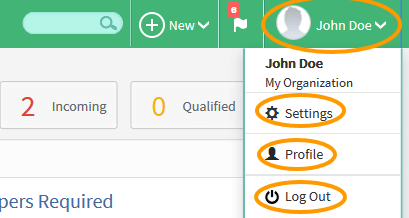 Click on ‘Submit’ button, then it will show the data to be imported and it will remove the duplicate record if you have already imported or the record is found in your CRM. After clicking on ‘Proceed’ button the records will be imported successfully. Choose ‘Other CRM’ in the dropdown list. Download the ‘Sample CSV’ file if you dont’t have. Insert data in the CSV file as per the column. Choose the CSV file to import. You can use migration in WakeUpSales to migrate multiple record at a time, if you are unfortunately trying to migrate the existing file it will automatically remove the duplicate records.